ALARD EQUIPMENT CORPORATION buys and sells new and used FOOD PROCESSING and PACKAGING MACHINERY for INDUSTRIAL vegetable (and fruit) canning, freezing, juice, bottling, and fresh cut applications, as well as all related packaging and labeling equipment for cans, jars, bags, and bottles. We offer this equipment as-is, tested for operation, or fully reconditioned, per buyer specification. We can also configure equipment with change parts and setup to meet our customers application requirement, as needed/desired. URSCHEL slicers, dicers, shredders, cutters. Cooking KETTLES by Lee, Groen, Hamilton, Cleveland Range, Vulcan, Legion, others. HOT WATER ROTARY BLANCHERS by FMC, LYCO, Rietz, A.K. Robins, Hughes, others. OPEN SCREW BLANCHERS, by Rietz, others. BELT BLANCHERS, hot water and steam. by Vanmark, Magnuson, Lyco, Eillert, others. PISTON FILLERS by Pfaudler, Elmar, FMC, PRC, Autoprod, Rutherford, others. BOTTLE FILLERS, by Biner-Ellison, MRM, Horix, U.S. Bottlers, Cherry Burrell, Fogg, Federal, Pneumatic Scale, Cemac, and others. AUGER FILLERS by Mateer, All Fill, others. TUMBLE FILLERS, by Solbern: PTF, PTF-DP, MTF, et al. CAN SEAMERS, CAN CLOSERS, CAN CLOSING MACHINES, by Angelus, Canco, Continental (CCC) , Dixie Canner, others. SCREW CAPPERS by Resina, Kapsall, New Engand, Pneumatic Scale, Alcoa, others. LABELERS, can, bottle, jar, hot glue, cold glue, pressure sensitive, wrap, spot, front/back/neck, by Burt, Krones, New Jersey, Label-Aire. METAL DETECTORS, by Goring-Kerr, Safeline, Cintex, Lock Metalcheck, Fortress, Ramsey Icore, Eriez Magnetic, others. CHECKWEIGHERS, Ramsey Icore, All-Fill, Hi-Speed, others. PUMPS by Cornell Food Pumps, Waukesha, Crepaco, Thomsen Centifugal, and others. TRAY WRAPPERS, by Anderson, Arpac, Barry Wehmiller, Tampco, Packaging Machinery Inc (PMI), Weldotron, Clamco, Sargeant, and others. PALLET WRAPPERS, by Lantech, Infrapak, Mima, Orion, others. CONTINUOUS ROTARY COOKER COOLERS by FMC, Sterilmatic, others. RIBBON BLENDERS, RIBBON MIXERS, by J.H. Day, S. Howe, Rietz, others. 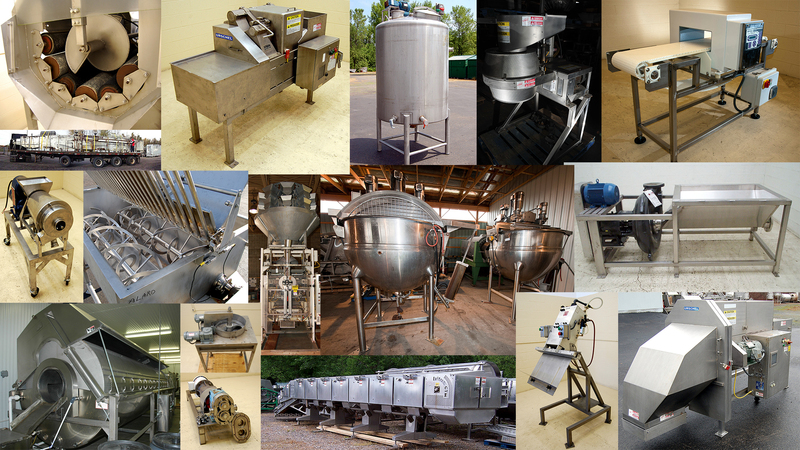 PADDLE MIXERS, by American Process, Rietz, Butcher Boy, Leland, Toresani, others. RETORTS, by Busse, Reid, FMC, Stock Rotomat, others. RETORT BASKET / CRATE LOADERS, Busse RETORT BASKET / CRATE UNLOADERS. SIZE GRADERS, QUALITY GRADERS, OPTICAL SORTERS. DEWATERING SHAKERS by Key, Commercial, others. VIBRATING SHAKERS by Key, Commercial, others. GRINDERS, SHREDDERS, HAMMERMILLS, such as Rietz Disintegrators, Rietz Extructor, Fitzpatrick Comminuting Machines, others. DEWATERING shakers, air knives, and spin dryers. WASTEWATER RECOVERY equipment such as Bauer Hydrosieves, Hycor Rotostrainers, scavenger reels, dewatering presses, etc. FRESHCUT PROCESSING EQUIPMENT, bin dumpers, trim lines, coring lines, inspection tables, washers, peelers, cutters, shredders, dicers, slicers, chillers, cooling flumes, dewatering shakers, spin dryers, netweigh scales, bag fillers, bag filling tables, form fill seal machines, vacuum gassing bag sealers, etc. Makes/models by CMI, CVP, Pre-Pack, Bock, Brothers, Urschel, Hayssen, General Packaging, Wright, Mirapack, Ilapack, Weighpack, PAC, Ishida, Yamato, Heinzen, Hobart, Hallde, Commercial Slicer, Waterfall, and many others. CAN OPENERS, by Edlund, others. CAN CRUSHERS, by Rescor, others. CAN EJECTORS, by ACE, others. AND MANY MORE makes / models / items!